A sure fire top ten on my list at the end of the year. I would have sworn this was the shortest of the videos, it appears to be the longest. Since I am behind on my film posts, I decided to use a video format to get three of these done today. Here is the first. It appears to be a little out of focus, sorry. A double dose of mutton for you. If you are looking for a horror film to disturb, frighten and repel you, skip the “Halloween” sequel and go see this docudrama. With a script taken frequently from actual transcripts at trial and notes from the investigators, you will still have a hard time believing the horror that really took place in a Philadelphia Women’s Clinic for more than thirty years. What is equally horrifying is the indifference of public health officials and the media because the crimes that took place were connected to the real third rail of American Politics, abortion. This film may be dismissed by some as a polemic about the abortion issue but it is played straight and honestly with the facts of the case. Pro-Choice advocates should be equally outraged at the crimes against largely impoverished minority women by a doctor who had little respect for them. The hubris of Kermit Gosnell is indeed the most frightening aspect of the film. This is a man who made choices in care motivated by greed, convergence and sloth. Character actor Earl Billings gets the biggest part of his career and he imbues it with a detached sense of whimsy of all things. Gosnell is sanguine about the whole episode. He believes he has done nothing wrong and like Nero, he plays while all around him is burning down. Billings comes across in the interview segments as a friendly family doctor, but there is a true madness there for how blind he makes Gosnell seem to the disgusting environment that he occupies. Ann McElhinney and Phelim McAleer are documentary film makers known for taking a contrary position on a number of subjects. This film is not a documentary but it is a non-fictional docudrama which sheds light on an event which says as much about political correctness as it does about abortion. 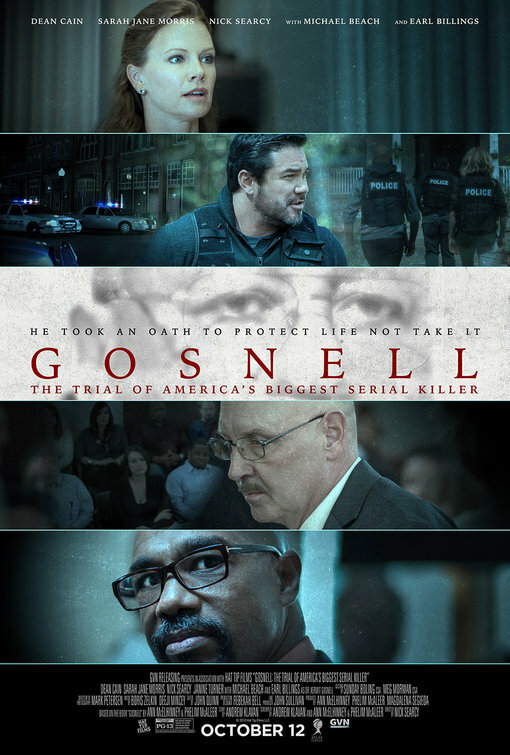 The fact that the story of Kermit Gosnell and his trial was largely ignored by the media is shown in an incredibly accurate and despairing moment in the film. The prosecutors in the case, expecting to be swarmed by journalists as the trial begins are in for a surprise. The fact that it took political gadfly’s on-line to get the story any traction is a shame. The difficulty of getting this film to theaters is also something of a problem. Director Nick Searcy, an actor who appeared in two of last year’s best picture nominees, has directed only two features. His first was made twenty years ago and has been largely unseen, this is his second directorial effort. With a small budget and a cast of second tier Hollywood talent, he makes the film feel much like a feature thriller in the first half. The film has a vibe like “Zodiac” because of the subject matter, but it lacks some of the cinematic touches that would make it a Hollywood entertainment. It is certainly more than one of those re-enactment shows you might see on the true crime channels. The movie is competent but without visual embellishments and script dialogue that is quotable. Searchy also plays the defense attorney at the trial and he does put on a vigorous defense of his client that the jury ultimately sees through. There is a choice to not reveal a photograph that was taken of an actual victim, and that seems to be the right choice to make the movie feel more even handed. It will be seen as a gimmick by critics of the film, but sparing the audience of the trauma revealed at the trial makes me feel relieved. The subject matter is serious and a real life photo in a movie like this might just be too exploitative. Although I described them as second tier, the actors in this film are not bad, they just are not stars. Dean Cain plays a real life Philadelphia detective who stumbles on to this case while pursuing a drug investigation. Sarah Jane Morris an accomplished television actress is the soccer mom prosecutor who believes in a woman’s right to choose but also in the law. These two play off of each other well but this is not a film that is about performance as much as it is about the culture. That society wants to look away from this subject is understandable. Opponents of abortion find horror in it’s mere existence and the advocates of choice don’t want to deal with the messy details that come along with those choices. Gosnell is one of those failings of the system that makes everyone look bad. In trying to distance the actions of Kermit Gosnell from the normal methods of operation in a woman’s clinic, the prosecutor examines another doctor on those practices. The defense attorney is actually the one who on cross examination, reveals some pretty damning insights about the whole business. The film may be horrifying but it is not an entertainment for the season. It is a serious look at a truly evil person who disturbingly enough lived among us. On the surface he comes across as an eccentric physician who claims to be there to help poor women. As we crawl under that surface we see what he really is, a monster. Jamie Lee Curtis and I are the same age. I wish I could say that I was in as good shape as she is. 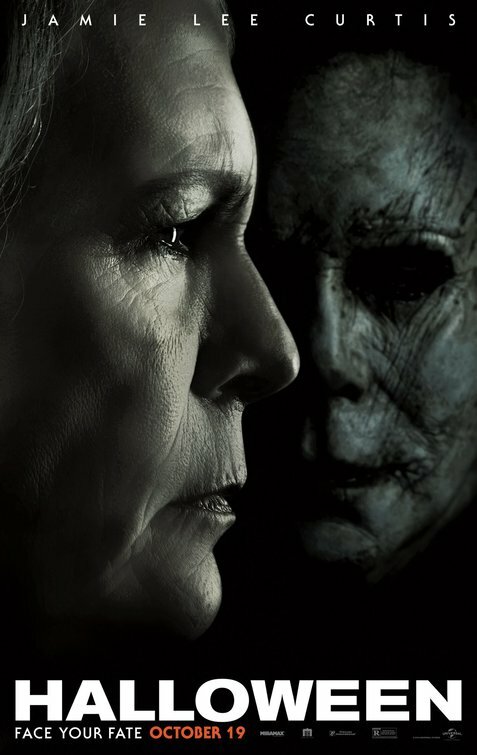 I’m also not the badass her character Laurie Strode has become in this update of the “Halloween” film franchise. This movie removes the history of the other nine films, and treats the original as cannon and everything else as a figment of the audiences imagination. I can go with that, but there are a couple of other films that I might want to save before I make this entry the cannon for the future. So forty years after the original events, Laurie has become a PTSD victim, who has passed on her paranoia to a second generation, or at least she tried to. In a plot lifted from “Terminator 2” , Laurie has been found to be an unfit mother and had her daughter taken from her when the girl was only 12. That daughter grew up to be Judy Greer, a forty something Mom with a daughter of her own in her senior year of high school. There are some pretty obvious beats being set up for the story. The goody goody grand daughter and her friends strolling through the town replicate the early segments of the original “Halloween”. Dr. Loomis has been replaced with Dr. Sartain, an apprentice of Loomis. And of course it is Halloween. So expect murders and costumes and people trapped in houses to be filling the screen for most of the time this film is running. The idea of the traumatic family dynamic is an interesting one but it is under-developed. We don’t really know how the relationship between the characters works. Sometimes it seems like the grand daughter and Laurie are strangers to one another and at other times they have a deep bond. Greer’s character seems to be indifferent to her Mother’s warnings, despite having been raised with the specter of “The Shape” looming over her through her whole childhood. It’s not clear if she is a chip off the old badass block or a snowflake who has turned a blind eye to the evil in the world because her Mom is a bit nuts. Jamie Lee is the stoic guardian angel who seems to have been plotting to kill Michael for forty years, but she loses her composure when she most needs it to warn the people she cares so much about. The inconsistencies in the characters undermine the story way more than it can take. There is a turn about three quarters of the way into the movie that is so out of left field as to be silly. I guess it was supposed to be set up by the opening visit to the mental hospital by two journalists. When the one reporter waves Michael’s Captain Kirk mask at him, all the other prisoners react while Micheal remains motionless and as silent as ever. It is as if Michael’s evil is contagious, and long term exposure will result in an infection of the same. The only redeeming aspect of this plot thread is that the new villain gets a gruesome comeuppance that looks like it is mostly practical make up effects. 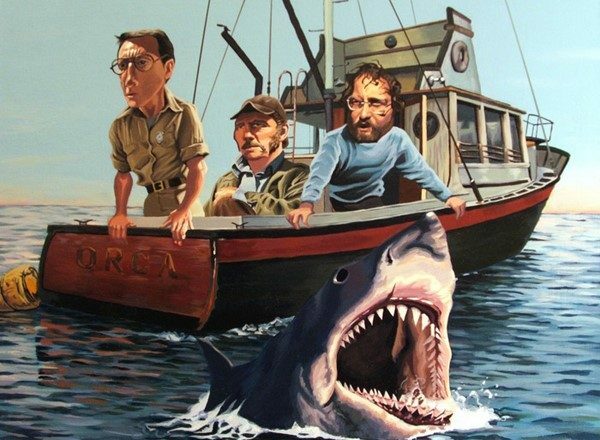 As flawed as the film is, there are several successful aspects to it. I’d say the best sequence is a replay of the scenario in the original film. A babysitter, with a romantic partner while on the job, has to confront the masked killer. There was some nice chemistry between the babysitter, her charge and even the boyfriend. It plays out with the characters fulfilling their destiny but with as much self respect as you could hope for ever one involved. Another very effective sequence involves Phillip Seymour Hoffman’s illegitimate son, confronting Michael in the shadow of a light connected to a motion detector. The staging of those moments was pretty tense and there is a solid payoff. I also liked the two cops keeping watch over Laurie Strode’s compound. The tone was humorous in a natural way and did not detract from the horror around it. Before we get to a couple of comments about the climax, let me rant about a couple of other things that I saw as problems. The whole relationship between the grand daughter and her boy friend is filled with some deep secret that never plays out. He ends up discarded as a character and Laurie’s grand daughter Allison, ends up as the new scream queen without much more personal development. The plot thread from the opening with the two journalists does get played out, but in such a contrived situation as to be irritating, in spite of the well put together attack that finishes that part of the story. Two shots in the film will immediately be recognized as reverse call backs to the original film. Allison sees a brief vision out of her classroom window, just as grandma had forty years earlier. That shot also foreshadows a moment in the climax that was the most enjoyable moment in the film. Replicating the double take that Donald Pleasence has at the end of the movie was the fan service moment that most worked for me. I did not see it coming, although I probably should have, but when it arrived, I laughed and smiled. A few weeks ago on the Lambcast, I mentioned this film as one of my most anticipated of the Fall season. That it opened on the same weekend as “First Man” and I still have not seen that film, is a testament as to how great my interest was. It has a compelling cast, an interesting setting and the trailer hints at violence, double crosses and surprises that will delight us. For once the ads don’t lie. This movie has a whole set of twists and turns that are character based rather than plot conveniences. The narrative is non-sequential and as a result build tension but releases that tension in very unexpected ways. There was only one moment that did not seem true to the story, and it gets explained in a less than satisfactory manner, but this was a minor quibble in a film filled with unexpected treats. The set up is slow but it reveals character secrets in a sly manner that keeps us guessing and anticipating. Some characters seem likable to begin with but turn into something else, others are obnoxious but have something valuable to them anyway, and all of them are only connected by the fact that they are at this one particular location. The “El Royale” may be modeled after the Cal-Neva club in Lake Tahoe. Stradling the border of California and Nevada, the club was a resort for the celebrity class but also an investment by shady characters in the underworld. Frank Sinatra was an owner of the club and some of his friends in the organized crime world had dealings with the gambling and celebrities. None of that comes up directly in the story, but it is strongly hinted that the resort in the film is owned by the underworld, and even though they have lost their gambling license they still have ways to make the investment pay off. After the arrival of the guests at the hotel, the story slips from a chronological structure to a series of flashbacks centered around each of the occupied rooms at the mostly empty resort. The characters are revealed by room number and the back stories are filled in. There is a criminal seeking a hidden cache of cash that we learned about in the opening of the movie which was set ten years earlier. A vacuum cleaner salesman appears to have a bug problem and there may or may not be a kidnapping taking place. The script, written by Director Drew Goddard, is not unlike his previous film “The Cabin in the Woods”. It turns a series of seemingly unrelated character pieces into a whole by the end of the movie. In my opinion this was much more successful at making the twists work because the film is less gimmicky and relies on the characters so much more. Jeff Bridges is the biggest name and his role gives him a chance to stretch a few muscles that he has not relied on in a number of years. While he is playing a grizzled character, it is one imbued with a odd sense of defiant melancholia. Cynthia Erivo plays a down trodden singer who is a lot sharper and world wise than she at first appears. She is also a remarkably good singer who manages to make a couple of scenes work really well as a result. Jon Hamm’s character is confusing at first and aside from some potentially insensitive racial comments might be viewed as a good guy in all of this. The film is set approximately 1970 but as I said, it trails back at times to story threads from a decade earlier. Dakota Johnson keeps her clothes on in this film and is reasonably well cast. This movie mixes the gangster story with a horrifying twist on a late sixties nightmare of a Manson style cult. Such a cult requires a charismatic center who seems to make sense but is even crazier than the world he thinks himself to be, enter Chris Helmsworth. It’s not hard to believe that lost souls could fall under his spell and when we get to the question of real evil in the story, he leaves no doubt where it resides. The director wisely lets us imagine some things about the back stories which may actually be grimmer than what we see on the screen. If there is a revelation of an actor in the film, it is young Lewis Pullman, who as a bell/captain manager of the hotel, has secrets he is actually desperate to reveal. If any of the stories are under developed, it might be his, but I only think that in hindsight because I suddenly want to know more, not because I need to know more. Comparisons to Tarantino films are inevitable because of the crime milieu, the non-linear story telling and the sometimes humorous dialogue that the characters exchange. There are sudden moments of violence and characters that we have come to connect with may turnout to be mistakes or to be short for this world. I think it was all well balanced as a story but it kept me off balance as a viewer. The casino setting and the time period are great ways to make the story feel more real since characters like this have to exist in another dimension anyway, but it still has to be one that is familiar. It also then justifies the use of a whole lot of great music as backgammon as well. This is a show piece for all concerned. The actors get to sink their teeth into characters that will be completely memorable, and the director gets to show off his style while entertaining us and keeping us in suspense. 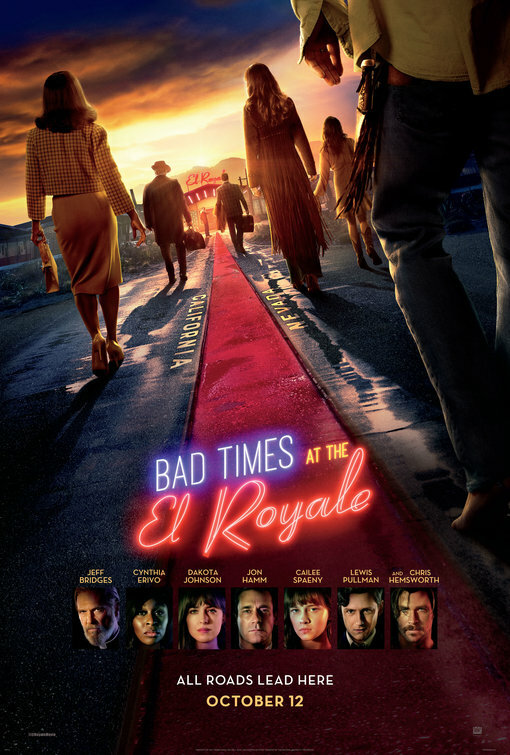 As far as I’m concerned, it was a “Good Time” at the El Royale.